So long are the days when we hung shower caddies from our shower heads or suction cupped them to the walls! The shower niche is now a requirement in shower design. They are an essential part of the efficiency of your shower space so they play a key role in the overall look and appeal of the shower. A key part of a successful design is when functionality meets aesthetic. What’s your niche? Having more than one niche allows space to also add decorative items and plants. This creates a nice center focal point to the shower and is great for including some decorative tile details. Why not have the niche run from wall to wall?! When you let the niche span the whole wall, often times it runs long enough to double as a niche for more than one area of the bathroom. Asymmetry is a really good effective architectural detail. So often we gravitate to typical symmetry, but that is not always possible or necessary. A balanced room does not equal a symmetrical room. Instead of a cutout niche, this shower has a ledge that runs along the back wall. This is a really cool alternative to the typical niche. This is a similar alternative to the consecutive row. Here we have one tall vertical niche with shelves in it, rather than separate niches. These niches work for either side of the wall. With a center wall between the shower and the tub, the pass through niche would allow for your shampoos to be accessible to both areas. Great idea! How about a niche with the sole purpose to house plant life! Bathrooms are a wonderful place to put your greenery and have them thrive. In-fact we wrote a trend alert on this last month! Having more than one niche is also extremely common. This way you can have one that is more decorative (for placing plants, and candles, and the like) and another that is intended more for useful (but not so pretty) items, like soaps and shampoos. 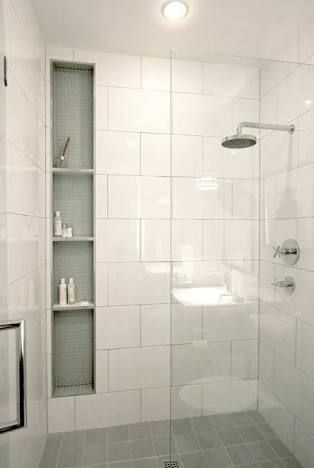 That niche can be placed in a less visible spot so you don’t have to see it from outside of the shower. All-in-all, when it comes to finding your niche, it is a combination of what your space will allow and how you would like to use your space.